Color Your Own: Thor Review – AiPT! This week, Marvel is debuting a huge line of comic book coloring books ranging from series such as Guardians of the Galaxy and Wolverine to more unique opportunities such as Women of Power and Marvel Tsum Tsum. AiPT! got the opportunity to check out one of these collections: Color Your Own: Thor. While it’s somewhat of an usual genre, I’ve reviewed coloring books before. Last winter it was Titan Books’ Alien: The Coloring Book, which was quite good. However, comic-related coloring books have a natural advantage over movie-adapted books because they can draw from real panels and splashes featured throughout the series. While I’m not well-versed in Thor comic history, it appears as though most, if not all, of the images are featured in the comics or covers rather than being originally sketched for the book. While some coloring book enthusiasts may be disappointed that there isn’t any original content, Marvel does a good job pulling a large array of diverse Thor-related images. These illustrations span decades of Thor publications and feature a ton of major comic book artists. The book contains sixty coloring pages featuring twenty-nine comic artists including Jack Kirby, JRJR, Frank Cho, John Buscema, Alan Davis, Mark Farmer, Mark Morales, and more. The majority of images feature Thor, but also prominently include other infamous characters from Throg and Beta Ray Bill wielding Mjolnir to Hela and Loki attacking our hero. What I love about the book is the diversity in artistic style and how many years of publication the collection incorporates, which allows for a 1970s Stan Lee/Jack Kirby issue cover to be next to a Jane Foster Thor cover. The only downfall of this book is the actual functionality of the coloring pages. While they are single sided and avoid colors bleeding through unto other images, many of the images are heavily shaded. This heavy, and sometimes unnecessary, shading limits a lot of coloring opportunities as some pictures are already half inked. 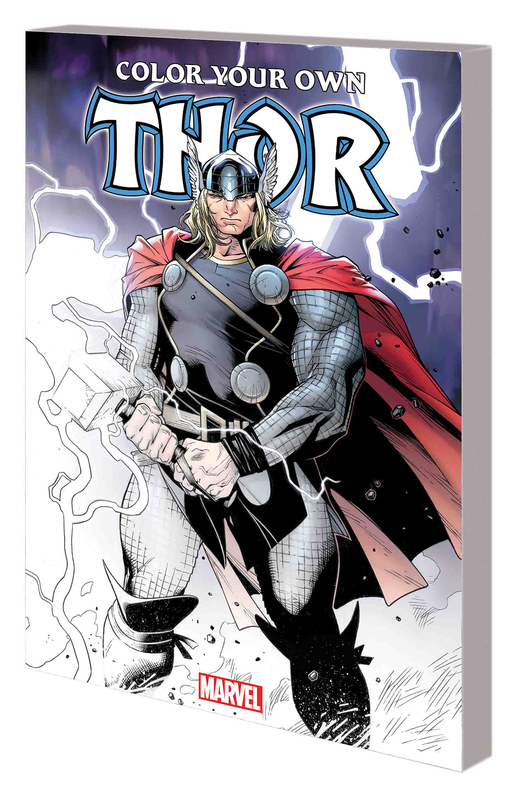 Color Your Own: Thor features a multitude of artists, artistic styles and characters from Thor’s history and gives you the opportunity to be the colorist for one of your favorite comic book artists. The only downfall is that some of the illustrations are heavily shaded and limit your ability to get creative. The book has a large diversity of images and characters, but sometimes goes too ink-heavy. The book includes a whole cast of Thor heroes, villains, and allies throughout the entire history of the character. These images are pulled right from your favorite issues so you'll be seeing art from some very famous comic book artists. The only downfall is that some images are very heavily inked and outlined which limit your coloring creativity significantly.